If you&#8217;re a programmer, system administrator, or web hacker just getting started with Perl, this workbook helps you gain hands-on experience with the language right away. 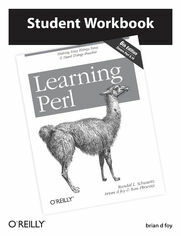 It&#8217;s the perfect companion to the 6th Edition of Learning Perl (known as &#8220;the Llama&#8221;), which is based on the popular introductory Perl course taught by the book&#8217;s authors since 1991. The first half of this workbook presents the exercises, with answers in the second half. The material covers Perl up to version 5.14.